Located on Tobago’s quieter western coast, away from the island’s more populated south, in the small fishing village of Castara you’ll get a sense of the ‘real Tobago’. Whether your aim on retreat is to soak up the local culture, hang out on the beach, or appreciate the splendour of flora and fauna, Castara reveals its hidden gems to anyone seeking a Caribbean experience within an authentic and welcoming local community. 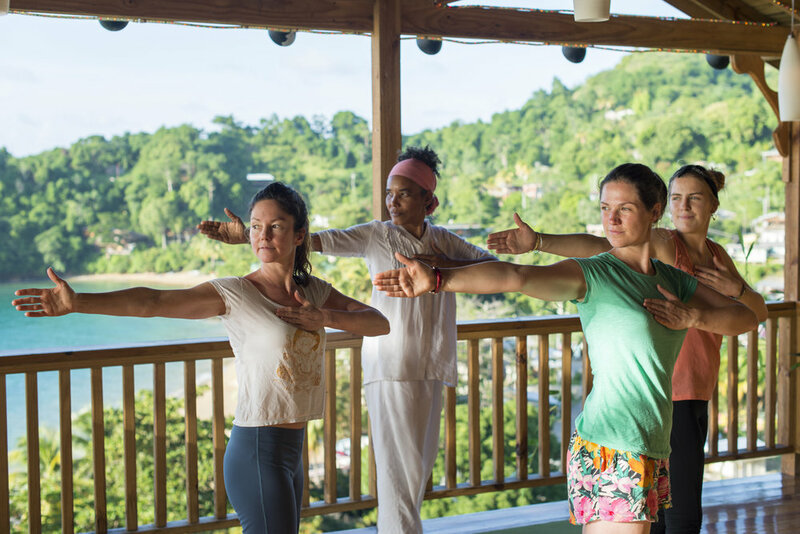 We’ll indulge in energy healing yoga practices, local cuisine, organic venue picked fruits, connection and fun! Nights of Reggae, chocolate from the local plantation and maybe even some glorious Tobago rum. The menu will satisfy all hearts and bellies. Join Kacy and Marla on this six night journey to paradise! Firefly is a compact air-conditioned studio apartment with en-suite bedroom, kitchenette and dining area. It also has a sweet garden terrace with lovely views towards the ocean and setting sun – a favoured spot for relaxing and drinking in the views. Firefly is the smallest of Castara Retreats’ accommodation options and is therefore the most modestly priced. Yet it offers the same high quality living experience in the atmosphere and facilities of Castara Retreats and is therefore great value. Constructed of cedar and with a polished pitch pine floor, Firefly offers contemporary living, while being immersed in a tropical garden setting. As night arrives, enjoy gazing up through the tropical garden alight with fireflies and beyond to the expanse of the star-lit sky. On the other side of the room is the compact kitchen area which includes two electric hobs, small fridge, toaster, kettle, sinks, pans, and crockery. Tamarind is a compact one-bedroom hideaway with en-suite bedroom, and open living space. Constructed largely of gorgeous red cedar which covers much of the ceiling and floor, this apartment has a warm and welcoming feel; the ideal space to relax and unwind. Tamarind is perfect for guests seeking a modestly priced option within the atmosphere and facilities at Castara Retreats. The open-plan living space faces west and is perfect for watching the setting sun, and for views both down the coast and out to sea. Hidden away below Birdsong , this studio apartment has an excellent sense of privacy and seclusion, and is not overlooked by any other accommodation. The driveway to Castara Retreats is located just below, and offers the quickest way to the beach. Four sun loungers and two beach chairs facing the ocean. Lime Tree is an all-wooden lodge offering high quality interiors for relaxation, and views looking out towards the spectacular Caribbean sunsets. It sits gently on the hillside and is surrounded by tropical gardens with star fruit, lime and banana trees and the famous red ginger lilies, which flower all year round. The spacious open plan living area has a beautiful hardwood flooring made from cypress trees that we harvested from local sustainable sources, and is furnished with comfortable sofas, chairs and double hammock. This space leads through to the en-suite bedroom with air-conditioning. The outside partially covered terrace is located in our tropical gardens and enjoys views to the ocean. The space includes a dining area along with beach chairs for relaxation. Lime Tree is configured almost exactly as Ginger Lily except that it has one bedroom. One of our original accommodations, Hummingbird 2 showcases the ‘living in the landscape’ concept with fabulous views to Castara Bay. Hand-crafted from local hardwoods, this apartment optimises the feeling of springing out to the environment in which it was built. The living space offers an open-plan layout for cooking, dining and relaxing, and astonishing views to Castara Bay can be enjoyed, looking directly to the beach, ocean and coastline. Though compact, the outdoor terrace truly celebrates the panorama. Living up to its name, hummingbirds feeding from the surrounding tropical flowers are a regular spectacle, along with a range of other birdlife – bananaquits have even nested in the candle holders that we provide for each accommodation!